Bentley: “I can slide one on before going to the vet or wherever I want to have clean ears when we arrive. They are protected from drool, too. Me: “If you have a long-eared breed, you might consider a snood. There are many places to order them or you can make them yourself. 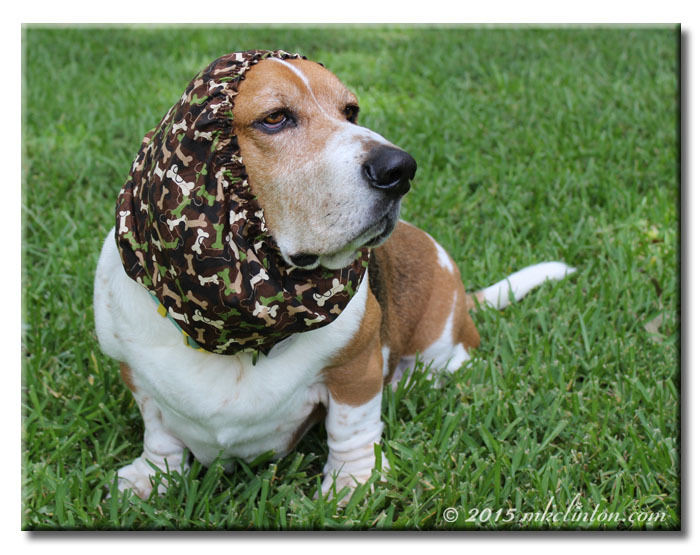 I ordered these great snoods from Howlin’ Hounds. Those are so cute. Bentley looks very Hollywood! Just needs some shades! 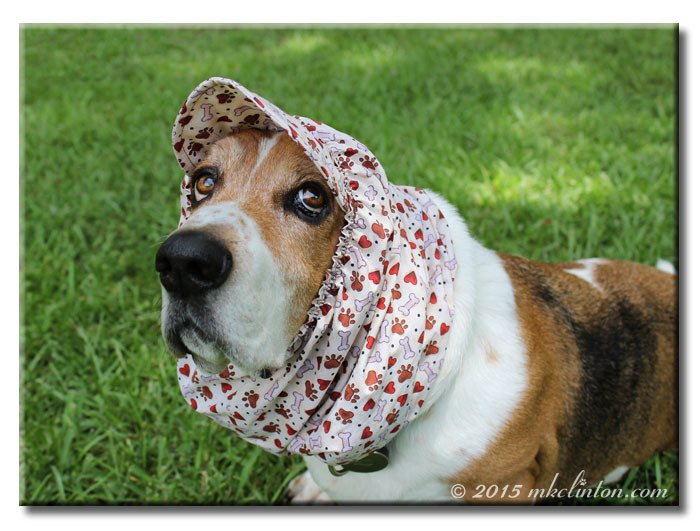 I have been learning a lot about sun protection for pets eyes, nose and ears recently... that snood is perfect for pet safety month and so, so super cute! Bentley, you should definitely hang out in the one with the visor! You do look so cool in that one! What a great idea, I could do wiv one of those to keep my ears outta my foodables! My long floppys are into everything too, but we have learned to deal with it over the years. I think the camo snood is the better choice for you. What a great idea! Bentley you look fabulous!!!!!! I might pick one of these up for friends who have two basset hounds. OMG, snoods crack me up. I see them at the dog shows and I giggle all the time. Lol! I've never heard of a snood before, but it makes a lot of sense for those long ears! My vote goes for the camo version! hahahahahahaha!!! OMD! Bentley, what have they done to you? haha! I've never heard of a snood, but they make perfect sense for dogs with long ear. It's not the coolest looking thing that's for sure. This is unbelievably cute. I think you have lots of friends who could benefit from this device! Bentley you really don't look too happy wearing those. Our mom thinks they look cute on you and are very practical for such a long eared pup like yourself. We don't have those problems. Bentley, you look like a yente! We think you might have a point about the chicks not diggin it! Thanks so much for featuring us today, MK! Bentley, that snood with the hearts is totally you. The babes are gonna love it! You look adorable Bentley! Meowm needed one of these when she had her Basset, she loved licking the plate after humans having pancakes......yep her ears were a syrupy mess afterwards. These things are a genius design, no? We had spaniels before and they are so nice to keep their ears clean. The long hair just got tangled with all sorts of food. Thank dogness my ears are pointy. Don't go giving my pawrents ideas. I prefer to be naked myself. I find that if you keep still like a statue, they eventually remove anything they try to make you wear. Apart from the harness. I lost that battle! Oh. Your Mom is even more awful and embarrassing as ours!!! We wished she hadn't read this post, but she really likes the snood! Bentley looks so cute! I never heard of these...but I like the idea. The tips of Cricket's ears are always so dirty! Snoods can be really helpful and these are really handsome! Those snoods are really cute on Bentley! It sounds like they are really helpful too. Less dirt and grime on the ears means less ear infections. Oh, a snood! My sis had one for her beagle long ago! Hven't seen one of those in a long time. You wear it well, Bentley! cute cute cute, I never knew what they were called. I got my tuggo ball today, will play with the dogs with it my next day off. Love the snood Bentley, I think it becomes you! That model with the visor is something else!